A 1990s can of R.G. Hardie "Airtight" seasoning. In December 2005, the rights to Airtight were assumed by Piping Themes. Soon after, the container became plastic. Most of these instructions will apply for other brands of seasoning. It is certainly recommended that you follow any instructions that are provided by your seasoning's manufacturer, though you may find that your bag requires less seasoning than suggested. Before you begin, remove any bag cover, the drones, chanter and blowpipe from the bag. If it's an older or previously overseasoned bag, shake any loose debris out of the bag into a trash can or over a spread-out newspaper. It would be a good idea to read the directions below completely before you start. First, get your Airtight seasoning ready to use. Airtight comes in plastic containers. Since its inception up until the late 2000s, Airtight came in a metal container, which complicated the preparation process and lead to storage problems. If you have a plastic container of Airtight, it's easy, just twist off the cap! There are three methods available to melt the seasoning: microwave, double-boiler, standing hot water. You only need to melt the seasoning to a syrup consistency. A completely runny consistency is unnecessary. The Airtight instructions state: "Remove cap, heat on high power for 1 minute stirring halfway through. Leave to stand for 1 minute. If the seasoning has not fully liquified, heat for a further 30 seconds and stir." It can't be much clearer than that! If you microwave has a turntable in it, put your container near the outer edge so it rotates around and heats more evenly. And definitely heed their suggestion of mixing and waiting. Method B. Requires a very close supervision of heating process. a. Set up a double boiler system—use a big pot and then place a smaller pot inside the larger. b. Fill both with water. c. Place the open can of Airtight into the inner pot. d. Turn on the stove to medium heat. e. Keep a close eye on it as you don't want the seasoning to exceed 140 degrees or boil! f. Once the outer pot starts to develop bubbles, turn down the heat a bit. g. Tip the can a bit with tongs to see if it's melted yet. h. Once you're pretty sure it's mostly liquid, you can stir it with something (such as a table knife) to make sure there's no large lumps, then remove from heat immediately. i. You will need to check the seasoning temperature. If it's warm enough to be uncomfortable to your skin, wait until it is not. You can place the can into a pot of cold water to accelerate the cooling process, just don't let the water rise and flow into the can. A simple double boiler system with a older style metal can. Method C. No risk of overheating seasoning, but may take longer. a. Get a small pot. b. Place the open container of Airtight into pot. c. Fill the pot with very hot water. d. Wait for the seasoning to melt some. If the water gets cold and the seasoning is still too solid, go back to step c.
e. Stir the seasoning with something (such as a table knife) to make sure there are no lumps. f. When the seasoning is a consistent liquid, remove from the pot. After you remove the seasoning from heat, you may wish to immediately pour it into a plastic squeeze bottle for easy dispensing. See discussion "Storing your Seasoning" below. Applying Seasoning to the Bag. 1) Having removed the drones, chanter and blowpipe from the bag, plug all the empty stocks with the exception of the blowpipe stock through which we'll pour the seasoning. 2) As added "insurance" for new seasoners I recommend putting wadded up paper towels into the drone stocks to keep the seasoning in the main body of the bag, unlike relying solely on rubber stoppers. To prevent the paper from slipping into the bag leave a small portion out and held in place with the stoppers. The chanter stock will get saturated so a paper towel there is pointless. An experienced seasoner can get by without anything in the stocks other than the rubber stoppers. The bag all ready for the seasoning. Notice the paper towels protruding from under the drone stoppers. Also notice the tongs and 8 ounce plastic dispenser bottle open and ready. 3) Pour about 4-5 tablespoons (2-3 for just "fungiciding" or "touch up") into the bag with the drone stocks pointed up then plug the blowpipe stock. If the bag is seriously in need to seasoning, you may wish to use a little more. When in doubt, use more than less. It won't hurt anything to use more, it just means more clean up of any excess. 4) Work the seasoning in the deflated bag for at least 15 minutes, especially the seams. Try and keep the drones upright. Put on the blowpipe and inflate the bag to full pressure. (Make sure your stoppers are tight. You don't want to catch one in the eye. It's happened.) This will force the seasoning into any stubborn spots in the bag that are not yet airtight, you can even lean on a fully inflated bag to increase pressure further. You may wish to keep blowing into the bag now and then over the course of 5-10 minutes to keep the pressure maximized. Remove the blowpipe and plug the stock back up with a rubber stopper. a. Put large rubberbands around the bag to hold the drone stocks and the blowpipe stock up (away from the chanter stock). b. Hang the bag—clothespins or "bulldog clips" will work as hanging clips if your bag doesn't have a loop at the end—allowing excess seasoning to drain out the chanter stock. c. If anything comes out of the bag, drain the excess for an hour or two over a sink or a container. Do not reuse any seasoning that has drained out of a bag! If you are not in a particularly dry climate or at a high altitude (or both), you may simply drain the bag overnightbut you don't want to dry out your bag! If nothing comes out of the bag in the first few minutes, just proceed to Step 6. The bag draining over newspaper, if necessary. You may wish to change the paper after the first few minutes during which you will get perhaps as much as 3/4 of any excess seasoning out of the bag.You don't want to hurt your floor! 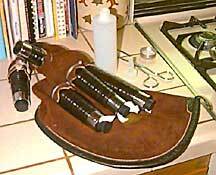 6) Remove the remaining plugs and clean out the stocks with paper towels, especially the blowpipe and chanter stocks. This is really important. Seasoning on your reeds is asking for trouble. Number 1 Rule: If you have one of the older metal cans, do not store seasoning in an opened can. If you leave unused seasoning in the can, it will definitely turn into green and black sludge even if it's refrigerated. The latest wisdom recommends storing the unused seasoning in a refrigerator where it will congeal. According to some, if left at room temperature the seasoning will remain liquid and can remain in good condition for "quite a while." However, there's been stories of "exploding" lids when opening a non-refrigerated container. I always put my seasoning into the refrigerator, as I believe most do these days. Putting the remainder into a plastic squeeze bottle is a good way to go, as it allows you to dispense the seasoning more easily, though it can be argued that you are required to unnecessarily reheat the entire quantity of seasoning with this method. Some suggest storing any unused portion into a sealed container, then later scooping seasoning out, placing into a small glass and heating using hot tap water (see "Method C" under the "get your Airtight ready to use" section above). The 8 ounce bottle after putting about 6 tablespoons into the bag. This photo angle is a little misleading as the bottle is about 5-1/4 inches base to shoulder and about 4 inches was left after the initial seasoning of this new bag. "How often do I need to season my bag?" Well, the pat but accurate answer is "when it needs it." Seasoning will help seal your bag, keep it supple, and aid in controlling bacteria and mold growth. When it should be done varies according to bag type and climate and use. Dry climate requires it more often, sheepskin requires it more often, and also more often for a dry blower. For some every three months is essential, others every 18 months is fine. A high-altitude locationsuch as Denver, Colorado, for instanceis going to require more frequent seasoning than the sea level of my "fog in the morning" coastal city. If your bag is losing air faster than it should or is growing undesireables within it, that's a good time to season. What's "faster than it should"? Well, everyone has their own opinion, but plug all your stocks but your blowstick, inflate your bag as tight as you can get it and then check it every few minutes. If it's still tight after 5-10 minutes (some say half-an-hour) you're in reasonably good shape. (Make sure your flapper valve is not leaking as it may be the culprit.) I once had a rather old bag that, when testing, I could completely deflate in under 30 seconds by pressing down on it—incredibly bad! I replaced the entire bag. "What's the seasoning made out of?" There's no official published Airtight contents list that I know of, but a few people have done some chemical testing and found that it's made of mostly lanolin suspended in glycerine and a small amount of lye. Not particularly toxic, but lye isn't that good for you if you are harboring any ideas about drinking it. "My container was already liquid when I got it, is that okay?" If your container is already liquid, it may be fineor it may not. If after a day in the refrigerator your container is still liquid, it's gone bad and should be discarded. Copper is known to help prevent mold growth. Simply placing a penny in your bag may benefit your health. A copper-plated modern penny should be adequate, though if convenient, you can use a pre-1982 U.S. cent most of which will be approximately 95% copper. Or a piece of copper piping from a plumbing supply would work too. Just be careful with that loose penny in your bag, with rough bag handling they've been known to knock into chanter reeds and chip them. A safer alternative is a light strip of copper foil or a raw copper wire twisted into a ring shape that's too large to move from the bag into the stocks—and the reeds! A little history of Airtight. Airtight Bag Seasoning was invented by Robertson Bagpipe Makers of Edinburgh. (The traditional common seasoning was honey, which has natural anti-fungal properties but also attracts ants!) In the 1950s, Airtight was acquired by R.G. Hardie and gained much popularity. R.G. Hardie went into liquidation in October 2005The Band Room which owned R.G. Hardie went bankrupt in August 2005. In December 2005, Piping Themes, a division of Gaelic Themes, purchased the equipment and ingredients, plus hired Hardie's seasoning makers to continue offering the product to the same standards. If you are considering a new bagpipe bag may be interested in visiting my page Bagpipe Bag Measurements and I also have a article on how to tie-in a bag. Page first created in January 1999.